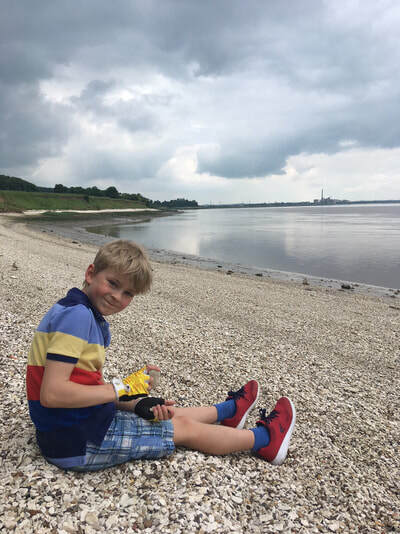 So we took two cars – one with the bikes on, one without and drove both to the Humber Bridge Park off Waterside Rd in Barton. We unloaded the bikes and left them with Grandma and The Child and The Dog who was busying herself barking herself silly at a drone that someone was flying near the bridge (The Dog does not care for drones – she would be very good as an early drone warning dog.) We then drove both cars to Cliff road in South Ferriby – just off North End and parked the car with the bike rack there. 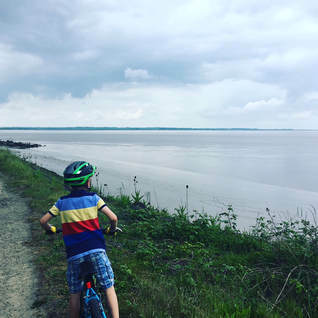 We then headed back in one car and parked at the Humber Bridge park where we collected Grandma and The Child and The Dog and got on our bikes. From the car park, we cycled along the track by the river which is a really pleasant ride. It is a flat surface and quite smooth and really interesting cycling by the river. 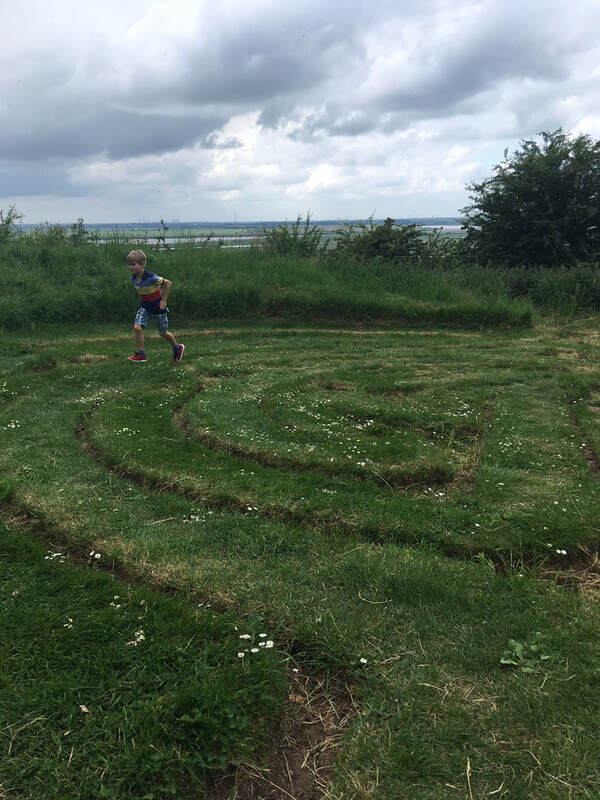 It was also very peaceful and you pass by the tile works and the Far Ings nature reserve. There are also numerous benches along the way so you can stop for a break if you wish. After a while the track stops and you have to bear left up Far Ings road, following the track around the back of a farm and onto Nev Cole way – a small track which is a little rocky but you can cycle on it. Just before this track starts to go more uphill, you reach a bit where you can see it looks like there is a path going down to the river and if you follow this you can still scramble down some steps which take you to the ‘secret beach’ – well it’s The Foreshore but it is clean and quiet and seems much less muddy than the North Bank. We sat and had another break here while The Child enjoyed skimming stones into the river. Onwards and upwards – literally, this is where the ascent started – it is not too taxing though and after a 100 metres or so it levels out again and you follow the track all the way until it spits you out on Cliff road. 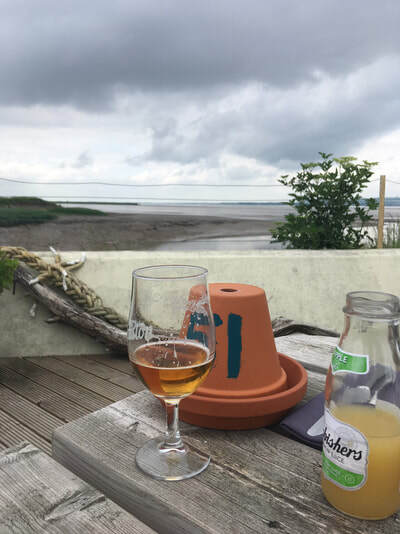 And now the icing on the cake – we loaded the bikes onto the car which we had left parked there and then drove to the Hope and Anchor pub in South Ferriby which is just down the road and had a very tasty lunch in the beer garden watching the herons and geese on the river. I think this was about 3-4 miles in total which was enough for us. After lunch we had a quick detour to Julian’s Bower (an ancient turf maze with a great view – about 10 mins drive away) A most pleasant day out! 4. Leave the grain and the fox and go back for the chicken.